The tour is part of a promotional campaign leading up to “Clash in Cotai II” – Manny Pacquiao’s fight next month against New York’s undefeated WBO junior welterweight champion Chris Algieri (20-0, 8 KOs). That was my first time ever to board one of Hong Kong’s iconic red-sailed Chinese junks; this one was called “Aqua Luna”. After three and a half years living here, it amazes me that I’m still doing things for the first time, almost everyday. It’s probably one of the things I take for granted about this city. Pacquiao made a special appearance Sunday at Statue Square in Central to meet some of the members of Hong Kong’s Filipino community. The national icon received a warm welcome from the excited group who are part of the community of overseas Filipino workers making a living in Hong Kong. 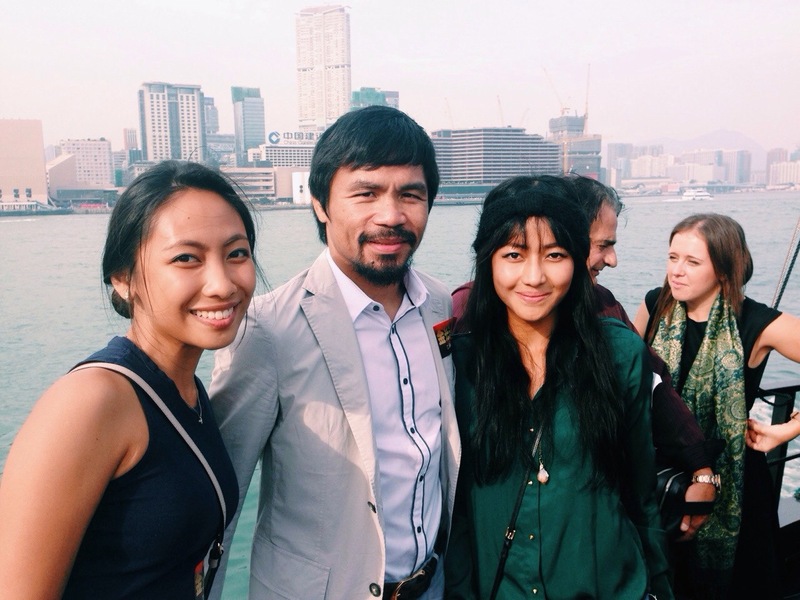 Later that evening, Pacquiao met with the respective representatives from the Philippine Consulate Generals of Hong Kong and Macao, at a meet and greet cocktail. Also in attendance were some of Hong Kong’s Filipino business professionals and community leaders. Nov. 23, 8 a.m.,at The Venetian®Macao. Tickets for Clash in Cotai II are on sale now at all Cotai Ticketing™ box offices*. The multi-bout event kicks off at Nov. 23, 2014, at the Cotai Arena. How much? HKD/MOP 24,080 (Diamond), 20,080 (Platinum), 12,880 (Ruby), 9,880 (Gold), 6,480 (Silver), 3,880 (A Reserve), 1,880 (B Reserve) and 880 (C Reserve). HKD/MOP 88 adds a round trip Cotai Water Jet ferry ticket between Hong Kong and Macao. Tickets can be booked online at www.cotaiticketing.com.